My brother is moving into his very first apartment in a few weeks and I have been commissioned to do a few paintings for his room. He wanted geometric shapes and clean lines in colors that match his comforter set. Instantly I went to work trying to find ideas and came across something from Pinterest that reminded me of one from the computer games The Sims. I am a bit of a nerd and spent countless hours (probably days) playing that game as a kid. Lucky for the ‘but I can’t paint folks’ this painting doesn’t take much artistic skill (or money for that matter!) so anyone can do it but getting perfect lines is the goal. 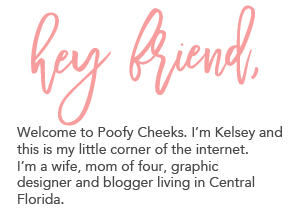 Kelsey is a wife and mom of four living in Central Florida. She shares recipes, crafts, DIY tutorials and so much more. Her passion is creating with her Silhouette and Cricut machines and sharing free cut files. Can I do the project with leftover latex paint? Excellent tip and very nice looking project!